The news last month of Enfield Council’s intention to deploy virtual assistant technology to help simplify its customer contact activities served to reaffirm the pressure that local authorities and councils are under to optimise service delivery. Perhaps not surprisingly, the story focused on how this will mean that ‘robots are replacing human workers in delivering public services’, and how this approach can be 60% cheaper than using people to carry out the same functions. Of course, it’s never that simple, but Enfield Council’s decision confirms exactly the challenge that local authorities throughout the country are facing. They know they are tasked with delivering improved services while at the same time facing budget cuts. They know that some of their existing digital investments aren’t yet realising the kind of performance and cost optimisation they had hoped for. And they’re finding it increasingly difficult to ensure consistent service delivery across a broadening channel mix. So will ‘robotic’ virtual assistant technology save the day? At Sabio we’re convinced that intelligent virtual assistants have an important role to play – but only if they’re considered within the context of wider customer contact optimisation. Many local authorities, for example, have built comprehensive digital service solutions but are finding that customers are still neglecting them for more traditional channels. For some, the challenge may be confusing web services that frustrate customers and drive unnecessary inbound calls. Another frequent service disruption is that council customers searching for online answers are often redirected by search engines such as Google to the main council switchboard. Adopting a more joined-up Digital Front Door strategy – with virtual assistants playing a key role – can help here. However, if local authorities are to really take advantage of the speed, accuracy and improved resolution rates that virtual assistants can inevitably offer, it’s important that they work to strike the right balance between their self-service, assisted service and contact centre activities. While user-centred online channels can of course deliver real benefits in terms of reduced customer effort and more cost-effective interactions, it’s critical to have clearly thought-through customer journey maps that are always ready to support users should things go wrong. 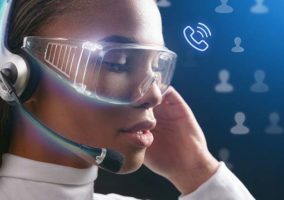 Improving the links between a council’s contact centre and digital marketing operations, for example, will be a prerequisite if local authorities are to really take advantage of the benefits of virtual assistants and AI technology across their contact operations. Particularly given that today’s successful Digital Front Doors need to provide access to end-to-end journeys that span both self-service and assisted interactions. So, if your digital journey isn’t performing optimally, you might use an intelligent speech-enabled interaction steering system, offer additional webchat support or use a virtual assistant such as Nuance’s Nina Web technology to drive customers to the right self-service sites. However, it’s also critical that you acknowledge the broad variety of council interactions and the need to ‘triage’ them through the system. If, for example, you want to find out about refuse collection or book leisure centre facilities then an automated service makes complete sense. This should also then release professional contact centre staff to handle the more complex social care issues that council contact teams need to deal with on a daily basis. That’s where the story of council robots carrying out human roles featured in the press falls down. By all means, automate routine interactions, but for the more sensitive and emotive issues, there’s really no substitute for properly optimised contact centres with professional agents who are trained to deal with the most difficult issues. Virtual assistants will clearly have an important role to play, but only if they operate as part of a truly joined-up service approach that also embraces innovations such as an intelligent Digital Front Door, joined-up digital marketing, speech IVR and fully-optimised webchat. Truly transforming customer contact for local authorities, of course, requires innovation, but it also demands deep sector expertise and best practice technology deployments. Robots help, but they can’t supply all the answers. Will Robots Replace Humans in the Contact Centre?